Barbershops are seeing a cultural resurgence as more and more men choose to have barbers style their hair and groom their beards. Actors, athletes and musicians trust their hair to barbers, some of whom are earning a level of celebrity themselves. However, this passionate interest is not a new trend. Barbering has a long history dating back to ancient Egyptian times, and it's safe to say barbering isn't going out of style any time soon. Is your barbershop equipped to provide exceptional service? As your talented barbers continue to expertly cut and style your customers' hair, those clients will continue coming to your shop for touch-ups. Men with medium-length hair may be visiting your shop every month or two. Guys with shorter, cropped hair may even drop by every two weeks to keep their cut looking fresh. With such an excellent opportunity to build a reliable customer base, it's important to be prepared. There is one tool no barbershop can succeed without — barber towels. In the 1880s, the typical American barber stocked enough towels to last a week. Although many of those barbers averaged one towel for every 10 to 12 customers, they understood how important a stack of fresh towels was. Today, we know sharing towels is unhygienic and potentially dangerous, which means you'll want a fresh batch of towels always on hand. Barbershop towels are ideal for a variety of uses, including the following. Tucking into the client's collar: Your customers need to be comfortable during their shave or haircut. As you trim someone's head or face, small pieces of hair can fall onto or under their clothing. Tucking a towel into the customer's collar keeps these stray hairs from dirtying their clothing or causing them to be itchy and uncomfortable. Wiping off excessive shave cream: Shaving creams hydrate the skin, protect the skin by minimizing friction and helps barbers track their progress so they don't miss a spot. The last thing a clean-shaven sensitive face needs is to feel a coarse towel roughly wipe away the leftover shaving cream. A soft, cotton towel is gentle on the face and won't irritate the skin. Keep the work area clean: Throughout the day, stray hairs will start to accumulate on the chair, prep counters and other surfaces. A stain- and odor-resistant towel is great for wiping away hairs, cleaning spills and generally keeping your workspace and barber chair free of debris. Clean and protect tools: No matter how skilled a barber may be, dirty or damaged tools can ruin a grooming experience. Thick and durable barber towels can wipe down scissors, straight razors, clippers and other equipment. A barber may also choose to set a towel down on their counter so their tools can rest on a soft surface. Though these towels are perfect all-around tools for any shop, perhaps the most notable use for a barber towel is the iconic hot towel treatment. First, you'll need a soft and breathable cotton towel. While any size could work, it's best to use a hand towel so it can comfortably wrap around someone's face. 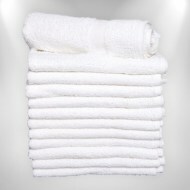 Our 15" x 25" premium white hand towels are ideal. Next, you'll select an oil and apply it to the towel. Oils like sandalwood, lavender and eucalyptus are solid choices, as well as Vicks VapoRub. Be sure to apply the oil prior to heating by dabbing a few drops in the center of the towel. Then, steam the towel by either running it under hot water, dampening and then microwaving the towel or boiling water in a teapot and drenching the towel. Remember to use caution when heating the towel so you do not accidentally burn your hands. Finally, place the steamed towel on your customer's face and let them enjoy the warm, soothing hot towel treatment only a barbershop experience can provide. Cotton fibers allow air to pass through the material, allowing it to dry easier. 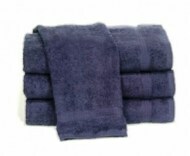 We price our wholesale economy and premium towels to accommodate any budget. Low-maintenance. Caring for your cotton barber towels is simple. Consistently laundering them and being attentive to any stains as they appear will help you keep them in peak condition. Naturally free of chemicals. Unlike synthetic fabrics, cotton is a natural material that is not manufactured with any chemicals. 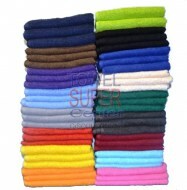 Why choose 100 percent cotton towels from Towel Super Center? They're soft. The face is the most sensitive part of the skin. None of your patrons want to feel a coarse towel scrape across their neck or cheek. Soft cotton towels keep your clients' faces free of discomfort. They're odor-resistant. Why chance ruining a customer's experience by placing a smelly towel over their face when you could confidently use barber towels that always smell fantastic? When you properly clean towels on a consistent basis, cotton will resist holding onto musty and mildew odors. They're durable. 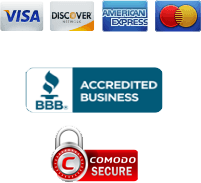 You need towels that can take on heavy use day after day, month after month, without fail. We make our cotton barber towels to withstand regular wear, which means they are less likely to fray, tear, stretch and shrink, leaving you with a reliable resource that works as hard as you do. They're stain resistant. No towel material is completely stain resistant, but 100 percent cotton towels can outperform other fabrics when challenged with cleaning up spills. If an unfavorable liquid or substance gets on the towel, just pretreat the spot and launder it quickly to minimize the chances of splotches or staining. They're attractive. Not only does cotton feel soft, it also looks soft. Its comfortable appearance, bright colors and the fresh smell will make great first impressions for your barbershop's new clientele. An unfortunate fact of working in a barbershop, beauty parlor or hair salon is that your employees will likely come into contact with blood. Whether the barber accidentally nicks a client during a shave or if they mistakenly cut their finger while cleaning a razor blade, there is a potential danger your employee could face this occupational hazard. In fact, if you fail to use proper hygiene and disinfection techniques, you run the risk of spreading diseases to both clients and employees. For the reasons, you may want to consider equipping your shop with a few of our bleach-resistant towels. Although bleach is great for removing stains and disinfecting towels, this chemical can potentially harm certain fabrics. Our bleach-resistant towels will retain their clean and vivid appearance even after being treated with bleach. Best of all, bleach-resistant fabric ensures even your dirtiest towels come out of the dryer looking great. Instead of discarding a stained towel, now you can effortlessly get rid of the stain. The fastest-growing profession in the United States is barbering. The National Association of Barber Boards of America predicts this industry will continue to increase an estimated 10 percent as more and more individuals become licensed barbers. Enrollment in barbershop schools is also increasing. Between 2014 and 2024, it's estimated the number of barbers, hairdressers and cosmetologists will grow from 656,000 to 721,600. With the potential of so many new students enrolling in your academy, you're going to need plenty of fresh barber towels. Pricing that is soft on your budget. The typical state barbering licensure examination will require students to have the necessary supplies, including clippers, shears, razors, towels, shaving cream and lotions. To prepare them for success, you'll need to ensure your school has the right tools for training. Minimize these costs by purchasing quality towels at wholesale prices and use your savings to invest in other supplies your students will need. Uniform towels that won't disappoint. Your students are going to go through a lot of barber towels during their training, which means you'll need a healthy stock of reliable towels that can withstand constant use. We can provide you with a supply of towels that are the exact size and color you need. Suitably sized for barbering. Though you can use any towel on someone's face, barbering students need to learn their craft with towels specifically designed for the face. Towel Super Center carries towels that are properly sized in the 15" x 25" and 16" x 30" range to sufficiently cover the face without excessive fabric weighing the customer down. While barber towels are the ideal supplies for barbershops, they are also perfect tools for countless other settings. Any hairdresser would benefit from a sturdy barber towel. Spas and hair salons can use barber towels to rest clients' feet on during pedicures or dry hands during manicures. Our soft barber towels also fit in perfectly at gyms and health clubs to wipe down equipment or to absorb sweat from faces or hands. 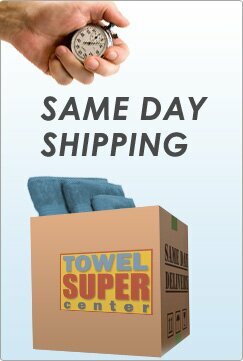 Regardless of need, the durable wholesale towels at Towel Super Center can handle the job! There's nothing like the feeling of a warm towel resting across your face as your barber prepares to give you an old-fashioned clean shave. This relaxing treatment does more than loosen the pores — it helps complete the barbershop experience. While this signature shave may be part of the barbering tradition, the classic hot white towel is now available in contemporary colors. Our 16" x 27" and 15" x 25" barber hand towels are available in 16 colorful selections. Choose from our array of colors and match your batch of towels to your company's color scheme. Pick a solid black or navy blue for a strong, professional appearance, or make kids' cuts fun with lime green, orange and purple colors. Even select a variety of red, blue and white towels to pay homage to the barber poles of yesterday. For those interested in providing the quintessential barbershop experience, Towel Super Center offers a huge supply of classic white towels. Our 100 percent cotton premium-grade, extra-soft white hand towels are available in 15" x 25" and 16" x 27" sizes. Barbers looking to receive the biggest bang for their buck will love our inventory of economical white barber towels that are affordable for every budget. 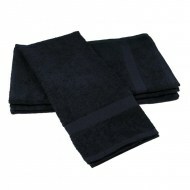 We also carry an 86/14 cotton/polyester blend of hand towels that are great for every hairstylist's toolkit. Wash them before the first use. New towels often come coated with a special fabric softener that won't absorb water well. Washing them before their first use cleans this softener off and makes them ready for action. Add white vinegar when washing towels. Distilled white vinegar used sparingly when putting your batch of towels in the laundry will help eliminate unfavorable smells. Using this natural solution on an as-needed basis is a great way to keep your towels smelling fresh. Wash towels separately. All towels, new and old, will shed. Washing them alone prevents towel fibers from getting on other items like barber aprons, and it will reduce the potential for pilling. Naturally keep them smelling fresh. Instead of using a dryer sheet, consider using scented wool dryer balls with a few drops of oil. Spraying the towel with herbal water before folding it will also help keep it smelling fresh. Have the towels in your barbershop seen better days? Give your shop an upgrade by purchasing a fresh stock of barber towels from Towel Super Center. Our wholesale pricing aligns with your budget, allowing you to get more high-quality towels at affordable prices. Having a bulk supply of matching towels ensures you'll never run out or have to constantly purchase replacements. Request a free sample today and see how relaxed your clients will feel when you place our warm cotton towel across their face. 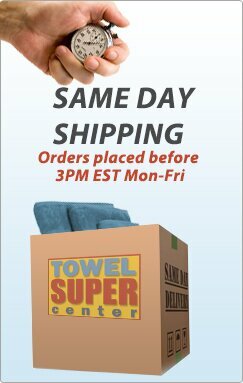 Towel Super Center is your direct source for all your bulk towel needs. 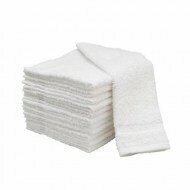 Along with our barber towels, we carry a variety of other quality towel and linen products perfect for any setting. We can provide your spa, hotel, salon or gym with strong, reliable towels your customers will love. After one use, you'll see why Towel Super Center is the go-to destination for businesses that need the best wholesale towels available.